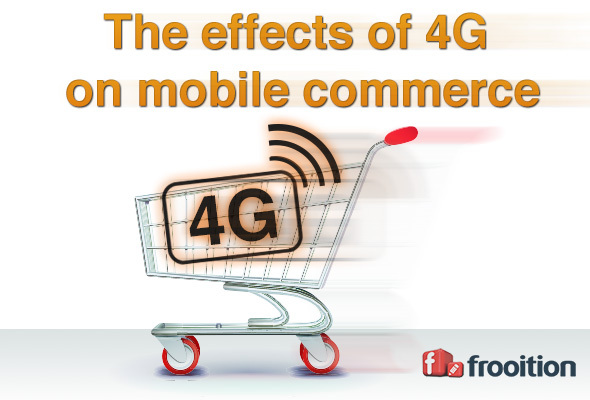 Great guest post article by Frooition highlighting the changes 4G will bring to ecommerce. 4G is rolling out to mobile networks across the Globe; users are beginning to experience faster, more reliable, mobile internet. Mobile operators are displaying TV adverts showing mobile users enjoying high quality HD content on the go, but what impact does this have on mobile commerce or mCommerce? The guardian estimate 4G will increase mCommerce by a staggering £1.8 Billion in the UK alone. That is an increase of 113% year on year. Is 4G going to make that much difference? The ability to view products faster allows buyers to view more products per minute, this seems like an obvious fact but if a buyer puts aside 10 minutes of browsing time on a break this increases the number of products they can research on that break increasing the chance of a sellers item being viewed. An increase in speed also cuts down buyer frustration when waiting for your item to load, this increases the customer experience and boosts the chance of a sale. As speeds increase there is less emphasis needed on reducing site content and functionality for mobile devices, the best mobile experiences mirror exactly the function and content of its bigger brother: the desktop experience. If you want to convert as many mobile browsers as desktop ones then you should be delivering the same content, with 4G speeds and bandwidth you no longer need to worry as much about using good quality, rich content such as large images and HD video. According to the Guardian, 49.6% of consumers are frustrated by the reliability of mobile commerce and 50.3% are frustrated by the speed. Reducing the number of frustrated consumers will have a positive impact on mobile sales. Buyers often have the best intention of browsing on a mobile device and then purchasing on a desktop or tablet device at a later date; however this can lead to buyers forgetting, being hit with offers from competitors or simply feeling remorse for buying the product therefore not closing the sale. Sellers will benefit from increased speeds as buyers can make more immediate purchasing decisions and checkout more easily. What can I do as a seller to benefit from 4G? Embrace mobile commerce. Do not view mobile buyers as different to their desktop counterparts (they probably exist in that segment anyway), create an immersive instant experience that doesn't differ between device. Keep your content the same and just ensure that it works on mobile. One strategy is to plan your ecommerce design and experience for mobile devices first; this means that you will not include anything extra that needs to be taken out for smaller screens. It also helps you focus on what are the most important features of the website as they will be displayed first on mobile. You can then translate this to hot spots on the desktop view. The best way to deliver a uniform brand and experience across devices is to create a responsive design that responds to the screen size and formats the content accordingly. Think of it like looking at the same landscape through different windows, the landscape doesn't change but your view of it does. At Frooition we design responsive websites for the Bigcommerce ecommerce platform with all the features being available across all devices. Updates are not required as new devices are released.